1) How often do you eat sushi? 2) What are your favourite sushi types? 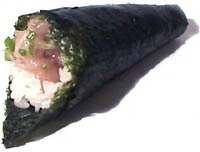 3) Which sushi types do you dislike? 4) Which sushi types do you eat frequently? 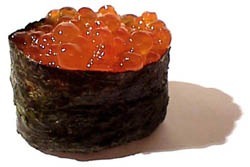 Sushi is not only the most famous Japanese food, but also one of the most popular among Japanese and non Japanese. Sushi comes in many forms: the classical nigiri zushi (small rice balls with fish and other small pieces of food on top), gunkan zushi (seafood in small cups made of sushi rice and seaweed), norimaki (sushi rolls), temaki zushi (sushi rice, seafood and other food in cones made of seaweed), chirashi zushi (seafood spread over sushi rice), inari zushi (sushi rice in small bags of deep fried tofu) and many more. But one ingredient is always present: sushi rice, cooked Japanese rice flavoured with sushi vinegar. For more information on sushi, please visit our sushi page. Next, we wanted to find out which sushi types are most frequently eaten. Survey participants were asked to select out of a list of 24 sushi types, the ones that they eat frequently. 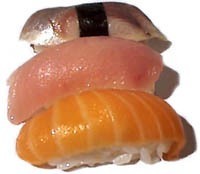 First of all, it must be said that in Japan nigiri zushi are most common and probably most readily associated with the term "sushi". 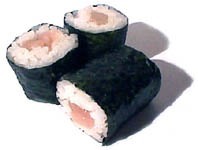 This stands in contrast to some other countries where sushi rolls are often more common than nigiri zushi. In our hit list of sushi types, nigiri and gunkan zushi occupy all top spots.